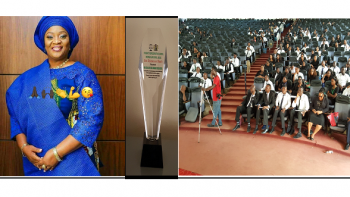 (Bwari, Nigeria, April 5, 2018:)The Students' Representatives Council (SRC) of the Nigeria Law School in Bwari, few kilometres outside Abuja, has presented to the Liberian Vice President, Her Excellency, Mrs. Howard Taylor-Jewel its ‘Life Time Achievement Award’. Graduating students, some faculty and invited guests, including the erudite Nigerian Human Rights Lawyer, Dr. Chidi Anselm Odinkalu, and Mr. Linus Okorie, a popular Nigerian Inspirational Speaker attended the ceremony. Vice President Taylor used the occasion to pay tribute to the late Winnie Madikizela-Mandela of South Africa, who she described as a female icon, an activist, a politician, and a positive role model for all women of Africa. Other speakers included the Nigerian Human Rights Lawyer, Dr. Chidi Anselm Odinkalu, and Mr. Linus Okorie, a popular Nigerian Inspirational Speaker who respectively discussed the underlying causes of development failures in Nigeria, and systems of global, productive leadership. At the end of the lectures, awards were presented to the guest lecturers.